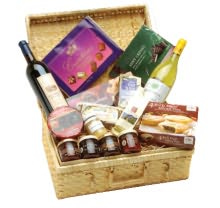 Corporate food gifts are a great way to demonstrate your gratitude and appreciation to your loyal customers. Sometimes, it can be very difficult to find the right gift for someone who has everything. 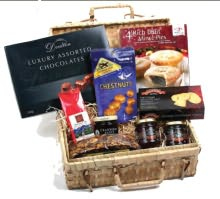 At times like these, you know you cannot go wrong with thoughtfully handpicked food gifts. A survey carried out by American Express in the year 2006 indicated that food selections have replaced gift cards and flowers as corporate gifts. Today, almost 50% of business gifts are related to food. There are many reasons for this rise in popularity with flexibility, easy availability of a wider selection and quicker transportation options being the three main reasons. When it comes to choosing food items to be included in your gift, the options are endless. Your selection could include different varieties of just one type of food item or even a combination of different but associated food items. For example, you could gift an assortment of chocolates or an assortment of wines or cheese or you could combine a selection of wine, cheese and chocolates, depending upon your client profile as well as your marketing budget. Quality should always be your prime consideration when you are contemplating giving away corporate food gifts, since the reputation of your company is at stake here. After you’ve gone through all the trouble of building your reputation, the last thing you would want to do is compromise it by giving your business associates a gift that is of low quality. When it comes to food, the quality or lack of it is immediately obvious to the recipient. I would advise you to never hand over the responsibility of choosing these items to just about anybody. To be sure that you’ve picked only the best items your budget will allow, you should take the time and trouble to do this yourself. Another thing you want to make sure about is that you choose items that are non perishable. Some foods have shorter shelf lives and are not appropriate for promotional purposes. For one thing, they need to be gifted immediately or else you could end up being saddled with all the extras that did not end up being given away. Moreover, most people do not appreciate receiving something that needs to be consumed immediately. With the wide variety of food choices to pick from, it is easy to get overwhelmed when trying to make a decision. What’s appropriate and what’s not? How do you decide? The best way to do this is to choose items with universal appeal. It is impossible to determine what everyone loves or hates. To avoid disappointing your recipients, make safe choices yet be creative enough to mix and match so that you have a gift that is unique yet will be appreciated by all. An assortment of high quality chocolates: Swiss chocolates, bitter chocolates, white chocolates, fruit and nut chocolates, praline, marzipan ... the choices are endless. A variety of fine chocolates is sure to please anybody. An assortment of cookies and crackers: Chocolate chip cookies, hazelnut cookies, butter biscuits, salty crackers... again the choices are endless. Pick a few good varieties and you are ready to go. Wines & Wine Accessories: You can make a real impression on wine aficionados by gifting bottles of wine with your own customized label on the bottle. Alternatively, you can put together an assortment of wine related items such as wine glasses and decanters, wine preservers, mini wine cellars and cooler bags. If you are envisioning going from one store to another looking for the perfect selection of food items, you don’t have to worry on that score. These days, you can get everything you want online. In fact, the internet is the best place to shop for the widest selection of fine foods at the best price. You will find sites that offer all kinds of promotional gifts from coffee mugs and wine glasses to pens and food. These sites feature detailed lists of products along with their prices and all other information that you may need. When you shop online, you have the advantage of being able to comparison shop between different dealers right from the comfort of your home or your office. This allows you to pick and choose the items you want included in your gift so that they fit within your predetermined budget, but again make sure that the quality is up to scratch. If you need further advice, help or have a question please do contact us, we’d love to hear from you.